Update: The transcripts from the India Tv website seem to have been removed. BJP's PM candidate Narendra Modi has made a special appearance on India TV's show Aap ki Aadalat with host Rajat Sharma. The show will be aired today at 10 pm in the night. Modi has spoken about not accepting the Muslim skull cap from the Imam, the issue of his campaign funds, and responded to Azam Khan's comments against him where he called Modi 'kutte ke bachche ka bada bhai.' He also discussed the issue of internal BJP politics and land being given cheap to corporates in Gujarat. “I believe in respecting traditions of all religions. But at the same time, I have to respect my own tradition. I can't hoodwink people by wearing such skullcaps… However, I believe in taking action against those who show disrespect to other's caps,” Modi told India TV in an interview. In response, Jammu and Kashmir chief minister Omar Abdullah pointed out that while Modi, during his rallies, has worn all sorts of headgear, it's just the Muslim cap that he seems to have refused. Abdullah said on Twitter, "And Mr Modi the problem isn't you refusing to wear caps/turbans for a photo op it's the refusing of only one type of cap that's wrong." He then retweeted a collage made from pictures of him wearing various types of tradition headgear found in India. On the issue of dissent from BJP's senior leaders such as Advani and Jaswant Singh, Modi's answers appeared a little unconvincing. When asked why Advani had been upset with him three times, Modi said he didn't think that was ever the case and that Advani had congratulated him after the official announcement and dismissed all other news reports as rumours. "They were all fiction. Because after Goa meeting, he called me up to congratulate me. He was not well so he couldn’t come to Goa. But this made juicy news for media," he said. 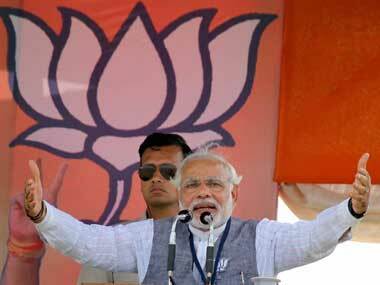 When asked about Jaswant Singh, Modi washed his hands of the controversy. He replied was that Singh had "has just written a review of one of my biographies," and that the decision to deny him the ticket was not Modi's but based on the State Election Committee's recommendation. On the issue of land being allotted at low prices to corporates such as Tatas and Adani, the BJP PM candidate dismissed these as false rumours spread by the Congress and instead put the onus on the central government to take action if he had indeed done wrong. "I say, is the Government of India asleep? Isn’t it its responsibility to reprimand a Chief Minister if he is involved in such malpractices? Why aren’t they taking any action?" he asked. He also added that he had the approval of the Supreme Court government for his land policy. "As far as land allocation is concerned, the Supreme Court has said that the policy of Gujarat government is so good that all States must implement that model," he said. He also refuted claims that land was given to Tatas for Nano. "In reality, Nano was not given a single inch land from the State government. No agricultural land was given to Nano," he said. When asked about why he had not accepted 'the topi' from the Imam, Modi replied that, "I have not seen Gandhi wear this topi, or Vallabhai Patel or even Jawahar Lal Nehru. There has been a change in Indian politics over the years. This change is that in the name of appeasement, do anything. I admit, my job is to respect all communities and religions, to respect all traditions." "But I have to live with my own traditions, and that's why I can't do this misdeed of wearing a topi and then trying to fool the people. Lekin agar koi kisi ki topi uchaalta hai, to main usko kadi se kadi sazaa dene ka maan rakhta hoon. (If somebody humiliates someone else, then I feel they should be punished)," he added. On the issue of his campaign funds, where Congress has alleged that Modi is spending Rs 10,000 crore on the campaign, Modi challenged Sonia to launch an investigation into it within 30 days. "First thing that Anand Sharma should do is write a letter to the EC. There is an Enforcement Directorate, they should get them to investigate. Their government has failed in everything, I'm giving them the idea that at least do this. They have 30 days, they can do this as fast as they want. I am also ready to write to EC to tell them that how much ever investigation Sonia and Anand Sharma want to do into Modi, they can do," he said. Modi also responded to Azam Khan's comment where he had called him "Kutte ke bachche ka bada bhai." Modi said, "Thank you because I don't think when it comes to loyalty there's anything better than a dog." Modi said, "I was brave, not naughty. There was a lake in my village and I loved to swim in that lake. I even had to wash my clothes there. So one day I picked up a crocodile baby and took it home. Later on I even took it to school and my teachers were very upset." India TV has put out the full interview which you can see here and here and here.